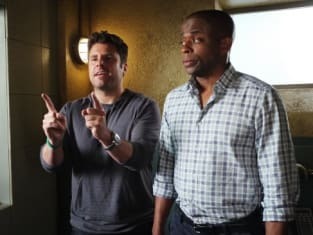 It was made rather clear on Psych Season 8 Episode 2: the world within this USA Network smash is changing dramatically. Just consider: Lassiter is going to be a father! It doesn't get much more life-altering than that. Will Little Lassie be a boy or a girl, though? It's clear which the new beat cop is hoping for. Regardless of the gender, the ramification of this news were quickly apparent. Never afraid of any situation before, Lassiter was suddenly cautious. He suddenly realized he had a life in his hands other than his own. It was interesting stuff. Elsewhere, Shawn, Gus and Lassiter tracked down leads together, the most entertaining of which led them to Trout's mother!